The best thing about window shopping is that it costs nothing, and I can always fill my camera with images I'll own forever. While on my "shopping" sprees, I always make it a point to pass by the The Flatiron Building in New York City to see what public arts projects might be on display there. Right now, Hu Bing's installation, "Shattered Debris, Sheer Transformation," created with found objects, resin, latex, light and re-shaped bottles, is on display. 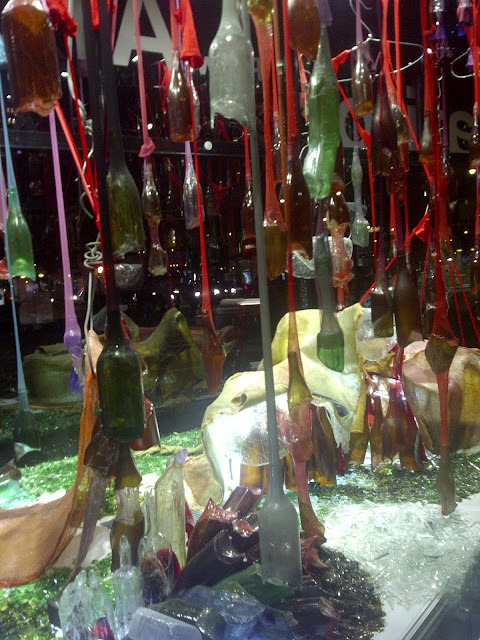 I could spend hours looking at this other-worldly display, imagining where the glistening fragments came from or how a bottle was transformed. 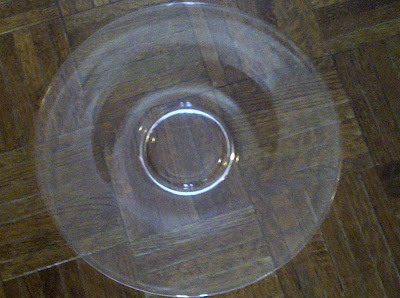 A real glass act! 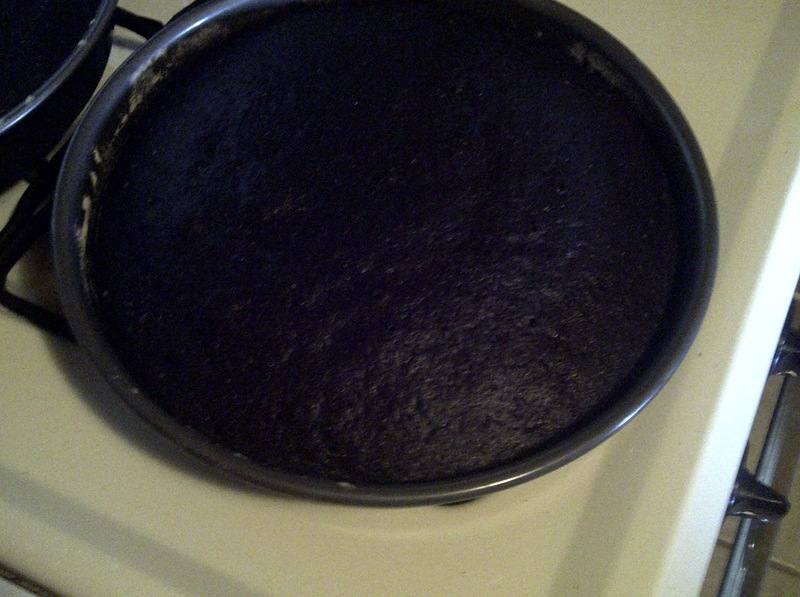 I had never made a black cake before. I'm not talking chocolate, but a black cake -- one that tastes like vanilla but is pitch black as the night. 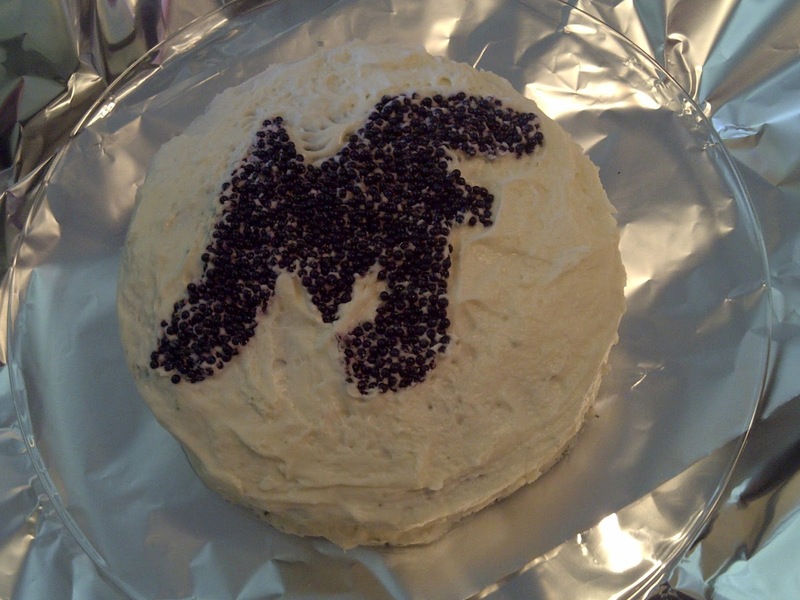 I knew I wanted to attempt making this cake I had dreamed up the dual birthday party of Master Michael Quinn and Queen Florence Montmare, which was conjured up to have a black-and-white theme. After purchasing black gel dye and black candy beads at N. Y. Cake & Baking on 22nd Street, I headed to Vintage Thrift where in less than five minutes, I located the perfect cake platter. Back at home I whipped up a traditional white cake as prescribed by the Magnolia Bakery Cookbook, and yes, I dyed it black. Once it came out of the oven and cooled, I frosted it with white buttercream and made a logo out of the birthday duo's first names out of black candy beads. Let the royals eat black and white cake! And they did. It's Memorial Day, and ice cream season is officially upon us! When I was a kid, a frozen treat was a reward for good behavior, acted as a lure to do something unpleasant or served as a central part of a celebration. It was around Memorial Day when we started having homemade ice cream. 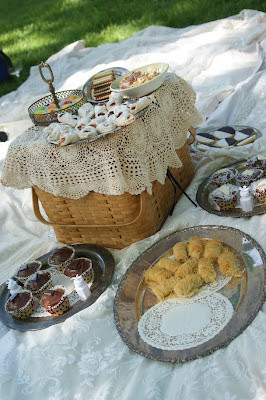 During summertime holidays, my Grandma Churchill's house was usually packed with aunts, uncles and cousins, so it took two ice cream machines to feed the crew -- one that was an old hand-crank model and the other that ran on an electric motor. Back at home, my sister and I would save our change and ride our 10-speeds up to Zarda Dairy where we would get a soft serve cone. 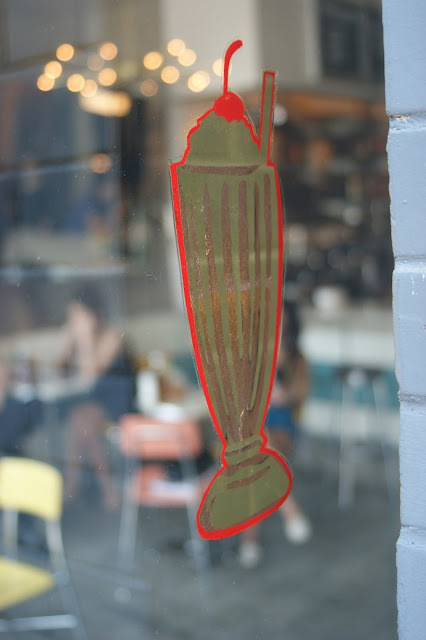 If we had extra coins, we might have it dipped in chocolate or splurge on a chocolate malt. Almost every day during the summer, an the ice cream truck jingled its way through the neighborhood, but the only thing I ever remember buying street-side was a red, white, and blue Bomb Pop. There were trips to the Dairy Queen for a Dilly Bar and stops at the Dairy Dip, a soft-serve shop near my Grandma and Grandpa Williams home in Mulberry, Arkansas. There was even sliced ice-cream, a trick that thoroughly impressed my sister and me. Instead of scooping Neapolitan ice cream out of the box, our family friend Marilyn Broyles would open the carton completely, exposing a perfect, tri-colored cube ready to be cut into generous, colorful servings. As summer drifted toward autumn and the beginning of school, it also meant it was time for our annual medical physicals. To sweeten the dreaded day, Mom treated us to a banana split at Baskin Robbins -- of course after the dreaded doctor's visit. If I'd spied this goodie at an estate sale, I, too, would have swooped down and plucked up for $5, just like my sister, Cheryl, did. Marked with "Collector's item by Gary Gail, Dallas" on its bottom and made in Japan, this little birdhouse-of-a-handbag became a clever offering to Mom on Mother's Day. Mom says she's going to make a debut of her treasure at church this coming Sunday. How tweet! 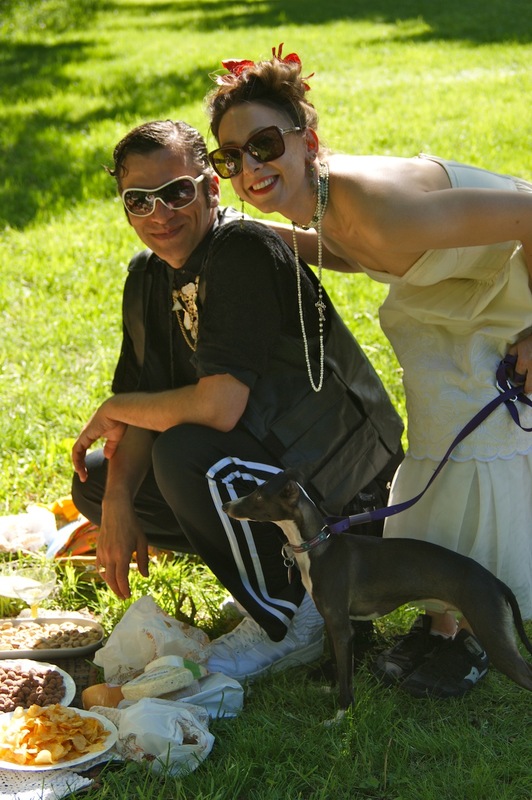 It was a day for celebrating a Black King and a White King, according to the invitation that Michael Quinn sent me for his dual birthday gathering with Florence Montmare, set to take place in a secluded corner of Prospect Park in Brooklyn. Guests were asked to wear black if they were friends of The King and white if they were of The Queen's party. I wore black and white, and made a cake to match. Here's Master Quinn and Madame Montmare in their party attire, putting the finishing touches on the lavish spread. 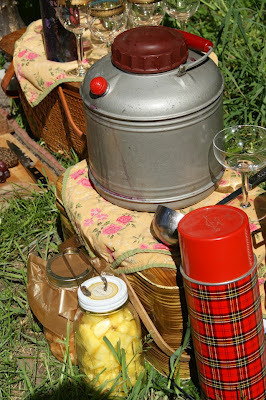 A Master Michael Quinn classic, vintage containers holding refreshing beverages and Mason jars filled with Sangria garnishes. 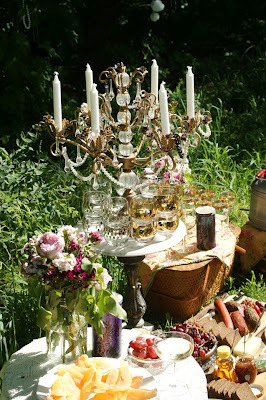 Madame Florence Montmare brought her candelabra and arranged it underneath a shade tree. A picnic basked covered and trays of goodies rest fragments of lace covering the grass. Guests of the royal duo stayed in the park until well after dark, lighting candles and lounging under a dreamy, starlit night. How often do you run into an almost-perfect chair in a thrift store only to leave it behind because the caning needs to be replaced and you don't feel like making the investment? Here's a clever remedy for not-so-perfect caning that HGTV's Genevieve Gorder showed off at Housing Works' Design on a Dime last month. 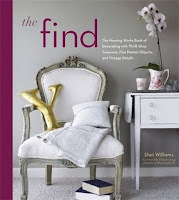 Rather than worry about the cost of having the chair's back replaced, she just stitched up the flaws with contrasting thread, creating a charming design element on a cast-off piece of furniture. 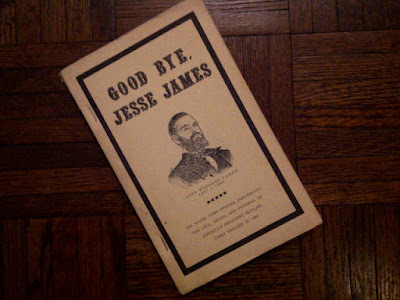 Found on a Brooklyn street this evening: Good Bye, Jesse James, compiled and published by the Jesse James Bank Museum in Liberty, Missouri. Mom, with my sister, about two months old, and me, at about 15 months. If you follow me on Twitter @elegantthrifter, I tweeted that I spent $7 on these goodies at a thrift store on the Jersey Shore. 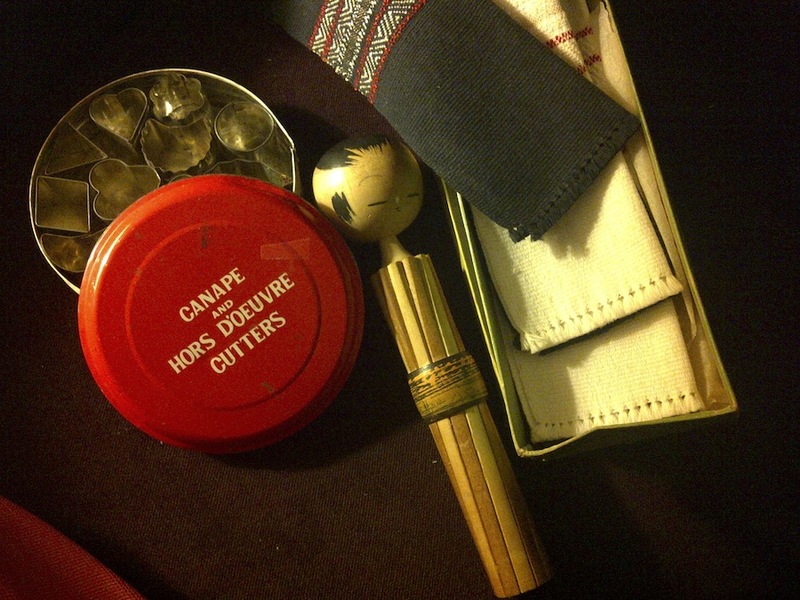 Let's see, the 1960s canapé cutter kit was $2.50, the box of handmade fabric coasters from the Philippines was $1, and the wooden Japanese Kokeshi doll was $2. That adds up to a grand total of $5.50. I was off by a whole $1.50! 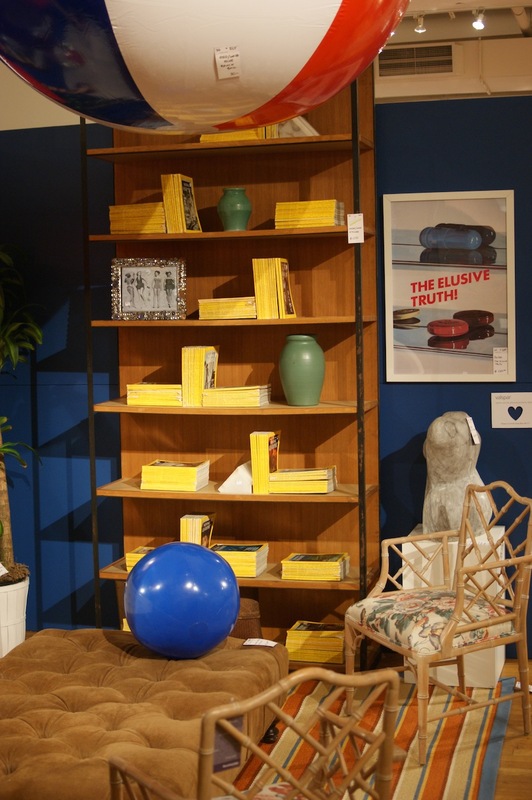 Here's a smart use of a colorful, mundane objects for decorating, and if you're looking for an adventurous read, it's right there on the shelf.